June 29, 2006, 12:06 PM · WILMINGTON, Delaware -- It was that time of year again: time for my violin to meet its maker. Its maker is Whitney Osterud, who, at age 33, has already established a reputation for his amazingly discerning ears. Osterud is the in-house violin maker and restorer at the violin shop of David Bromberg, a collector and historian of American violins (and a renown blues guitarist). Osterud trained in the Chicago shop of Carl Becker. He is Chicago-based soloist Rachel Barton Pine's personal violin adjuster – she flies him out to work on her instrument before recording sessions and concerts. Almita and Roland Vamos also call him up to adjust their instruments. I first met Whitney Osterud in the spring of 2005, in the middle of my search for a new violin. We had actually come to him for a violin adjustment, not really to look at violins. We'd heard of his reputation as an excellent violin adjuster at David Bromberg's new violin shop in Delaware. While we were there, we asked Mr. Bromberg if had any small instruments, as I have small hands, and we had been looking for a smallish violin. Of the six instruments I tried in the shop, one was a clear favorite. I found it easy to play; it fit me perfectly. And I loved the sound of it. When I peered inside the f-hole, I noticed the name "Whitney Osterud" on the label! The other five instruments I tried that day were older, mature instruments, some quite a bit more expensive. But when I played Whitney Osterud's violin, I knew my search was over. I was visiting him the other day for seasonal adjustment. My mom and I drove down to the shop on Market Street in downtown Wilmington, Delaware, in an unlikely urban area bustling with dollar stores and Caribbean restaurants. It's in a beautiful old restored warehouse, decorated with violin curios, violin sculptures, and filled with hundreds of violins. The backroom, where Osterud and bow maker Glenn Bearden work, smells pleasantly of wood and varnish. I started with the opening to Introduction and Rondo Capriccioso. "Hmm, it’s a little nasal, overall," he said. He took the instrument and tapped it gently at the foot of the bridge with a metal ruler. I played the passage again. Oserud looked thoughtful. "It's a little more open, but still tight on the A and the D," he said. More tapping. "Play a scale up the G string." "Smaller. Not as big a sound. Play something different, something fast." So I played the opening of the Rondo. Tap, tap. "More inward, now. A better tone, yet more inward. We need to get that same tone, but get it out…"
We continued like this for half an hour. Then suddenly I played the opening of the Introduction again, and Osterud exclaimed, "That I like!" "I like it too!" I said. My violin was singing again. Osterud modestly attributes his adjustment ability to techniques he learned while working as a craftsman in the Chicago studio of Carl Becker. "Mr. Becker taught me how critical set-up is to tone, and how to make an instrument perform up to its optimal level. I learned what to listen for—as well as what not to listen to—and when I started to hear what he was talking about, I just ran with it." Osterud makes about two or three violins every year, but he spends most of his time on restoration work. So far he's made 25 violins, two cellos, and two violas, although in the future he'd like to spend much more of his time making instruments. I was curious to learn what led Osterud into violin-making and restoration. It's one thing if you happen to grow up in Cremona and come from an old line of violin-makers. But how does a regular American kid end up in a business like his? "I combined my two favorite hobbies to make a career," he says. Osterud, who started playing Suzuki violin in kindergarten, in his home town of St. Paul, Minnesota, and studied throughout high school. He also loved working with wood. "There is no profession for model-making, so I became a violin maker." Osterud's first foray into violin-making was in high school. He was looking for a better instrument for himself, and found an $80 violin an antique store, which he took to Miller and Fein Violins, a shop in St. Paul (now Fein Stringed Instruments). They told him it would be $1,800 to fix. But, would he like to sell it to them for $650? He ended up selling it. Over the next few years he bought and sold violins until he found one that Andrew Fein said "wasn't worth the wood it's made of." So Osterud decided to work on the violin himself. He would go to the shop and ask Andrew Fine questions -- "How do you do this? How do you do that?" Then he'd go home and work on the instrument. Finally, Andrew Fine invited Osterud to come work in his violin shop on Saturdays, and he began tutoring him in restoration and repair techniques. Osterud graduated from high school in 1991 and went to the Chicago School of Violin Making for three and a half years. While he was in school, he also worked in a violin shop on the side, learning restoration and repair techniques. The school is very small – while Osterud was there, there were 21 students in all. It's a difficult course, and the attrition rate was high. Of the seven students who started in his class, only two students graduated. At the school they worked 8:30 a.m. to 3:30 p.m., Monday through Friday. "It was kind of like a job," said Osterud. "You sit at a bench, work until you complete something, and then bring it to your teacher." In the first semester, you are required to make a violin body. In the second semester, you make two more. In the third semester, you make three scrolls and set them into the three instruments. In the fourth semester, you make a viola body and varnish the three violins. "When you're first learning to make a violin, a lot of things won't make sense. Why do I have to do this step? It won't all come together until you're done. Each step builds on the next. It's cumulative." One of the requirements for graduation from Chicago School of Violin Making is to produce a violin in six weeks. This is accomplished by having made a violin in the white in advance and set aside. You varnish the first one, then make another one in the white, since the varnish takes so long to dry. Students also must take written exams, be able to play a solo piece on an instrument, and render a full technical drawing of the instrument. "The drawing is a little mechanical, and a little artistic," he says. "After you graduate you know how to make a violin one way, but you have so much more to learn. There are many more ways to make an instrument. In school you follow your teacher and learn everything you can to make an instrument one way. Then you begin the next phase of your learning, working in a shop." After graduation, Osterud returned to Minnesota, where he worked for Miller and Fein for four years. "There, I processed what I'd learned at the Chicago school," he says. "Then I was ready for the journeyman stage of my career. I contacted Jenny Becker, the daughter of Carl Becker in Chicago, to see if he could work in her Minnesota shop. She liked my work, but she wasn't hiring, so she sent me to work for her father, Carl, who I believe to be the greatest living maker in the U.S."
In 1999, Carl Becker hired Osterud as a craftsman. He stayed with Becker for three and a half years. When David Bromberg invited him to Wilmington to take a look at the shop he was starting on Market Street, Osterud decided to accept the opportunity. Their shop, the only violin shop in Delaware, is in its third year. I asked Osterud what advice he has for a young person interested in a career in violin making or restoration. "You need patience and attention to detail; the ability to sit at a desk an stare at something for 3 hours straight, to care about 1/10th of a mm measurements. You need to understand that most makers and restorers are in the profession for the joy and satisfaction it brings—you probably won't make lots of money. Dealers make the money in this business. Some people go into violin-making or restoration thinking, oh, it's so romantic! Then they realize it's a job. "As in violin playing, you need to learn how to make your left hand and right hand do two different things simultaneously," he said. "Knowing how to sharpen your tools, and understanding mechanics is important. But these skills can be learned." Osterud says that woodshop skills help, but aren't crucial—some people whom he went to school with had never worked on violins before in their life. "Right now, as opposed to a century ago, the state of violin making and repair is at a very high level," says Osterud. "There are still a lot of people out there doing violin repair work on essentially a student level. And, there's a need for that sort of work—maintaining instruments in rental shops, for example. But it's important to remember that set-up is critical to any instrument; otherwise it will be difficult to play. The first ethic in violin restoration should be 'Do No Harm'—do nothing to an instrument that isn't reversible. You'll need to spend years as an apprentice and journeyman in a fine shop in order to do quality work. 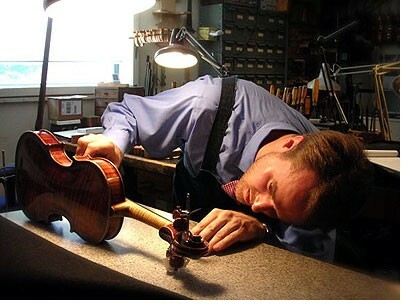 It takes a long time to learn the craft of fine violin restoration." "What I do is a craft, not an art," he insists. "When I'm in the company of artists, and somebody asks me whether I'm an artist, too, I say no. They ask, what do you do? I say I'm a violin maker. They say, well isn't that an art? But I'm making a tool, not an object of art specifically. The art is the music itself, and I love being part of that process." June 29, 2006 at 09:09 PM · David Bromberg is awesome! I had no idea he had a violin shop... that is really interesting. I didn't know if he was even still alive or what he was doing. Maybe I'll stop by and look at bows or something one day, and I'll get to meet him. That's soooo cool. June 29, 2006 at 10:25 PM · Very nicely done interview Caeli. June 30, 2006 at 04:17 AM · What a joy to read. Keep it up!